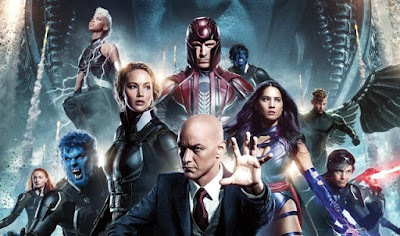 We have been burned by X-Men films in the past (my husband still prefers to pretend Last Stand doesn't exist) and so we restrain our excitement and go without high hopes, which has mostly worked out well. X-Men: Apocalypse has some cool stuff in it, and is reasonable entertainment, but did not blow me away. It's very definitely a sequel, but because the two preceding films didn't mesh well parts were a sequel to one, and parts were a sequel to the other and it didn't feel like it all gelled. The story seemed to rely on knowledge of (and clips from) the previous films, but the X-Men franchise has not been anywhere near as consistent as the MCU for example (though I appreciate it pre-dates it), so too much harking back seems a little foolhardy. Though I guess they got to reuse a few set designs. Plus in many ways things being a bit confusing and not making much sense with what went before is very appropriate to the source material (my husband has explained portions of the Summers family tree to me, several times). Those characters who were given much to do had reasonable plot lines, although they were often pretty standard and some were downright cliches. Bringing in new/old characters at different ages is hardly a novel trick for X-Men at this point, but it all feels a bit superficial when they haven't sufficiently aged the older new characters. Some new characters were not given much in the way of backstory or motivation, and while everyone can't get equal screen time it seemed like there was a lot of focus on established characters whose backstories are already known to us. Though bizarrely much of this examination of the previous characters didn't really fill the gaps so much as explain to us what we had already seen. Passing the baton is a tricky thing to navigate, but I think there was too much caution in this area, as though the younger/newer characters couldn't be trusted to engage our attention. There were some moments of meta, that were kind of amusing, but also seemed ill-advised and cockier than I feel is deserved. Overall it was fine, but I think they have to do something pretty different or particularly good to impress me at this point. Spoilery Random Thoughts in list form - this is a thing now. How much sand and grit and dirt does Psylocke have in her swimming costume? It occurred to me at Auschwitz and I could not stop thinking it in Cairo. It is unhygienic and she must be super itchy. So that mother and daughter were always going to get fridged so hard. Did they have names? I don't recall. I mean they were obviously going to die so who actually cares? It is kind of tedious. Plus why is Magneto a family man working in a Polish refinery? Sure tell us all about that thing in Washington we already saw, but don't explain what happened between the films by any means. Why did he stop being Magneto, I mean that was the main thing he had any interest in? Charles is happy and being a professor again after that period of drug abuse and self-pity in the 70s, which has left him curiously unravaged by time. I don't remember why he was sad in the first place to be honest. Hank is at least pretty consistent, while also looking curiously young. Perhaps he has been experimenting again because if there's one thing this sequence of films has established about Dr Hank McCoy it is that he's very concerned by his looks. It's cool that Mystique is some kind of icon for mutants. She's had the main surprising and different storyline in this half of the franchise, so good on her. Are there female teachers at this school? Should two male teachers be wandering into a teenage girl's room at night. I mean I know Prof X is the only one who can help Jean, but shouldn't there be a lady there to chaperone or something? So how many timelines are there now? I know they don't want me to think this, but tough it happened. I figure there's got to be at least 3 because bits of this tie up with some previous films, but none of it works with all of them. I mean if Kurt, Scott and Jean had all been there before then the events of X2 make no sense, but I don't think this can be in that timeline at all. Yay, Nightcrawler! I do like Nightcrawler, glad he is there. If people say BAMF online my first instinct is always that they are saying Nightcrawler's teleporting noise, which can be confusing because I know it means something else. Scott did not irritate me here, it may just be a matter of time but I find I'm never that bothered by Cyclops. Moira McTaggert is back, yay! She didn't slap Charles when she found out what he had done to her, boo! Seriously though it has been twenty one years since First Class and ten years since Days of Future Past, so a comment on how Moira's hardly aged a day doesn't cut it, especially as she has no mutant powers to explain it (not that most people's powers do). Stryker also looks pretty similar, and not like that guy with the beard at all. Quicksilver should look properly different, or should have been an actual teenager in the last one. Magneto manages to look a bit tortured, so maybe that helps. It's not like there aren't make-up effects that would do the work. On a similar point how much older is Havok than Cyclops? Havok was a teen in the 60s and Cyclops is a teen in the 80s, so that's a fair age gap really, even though Havok somehow still looks like he's only a few years/a decade-maybe older than Scott. Their powers don't explain this. I like that Charles doesn't realise he's lost his hair yet when he battles Apocalypse. From the trailers I thought it would get burned out by Cerebro. I expect that was a surprise, shame we didn't see it. Quicksilver's sequence was good again, one of the better bits as beefore. His sequences show a lot of invention, which is cool. Why doesn't Quicksilver tell Magneto who he is? It's just kind of left there. Sophie Turner's version of Jean is good (I'm not always that bothered by Jean as a character either). I quite liked her and thought it was cool that she got some proper fire. Though she can presumably remove Magneto's hat and then mind control him, so she's already better than Prof X.
Jubliee did not get much to do. Why does Psylocke do anything that she does? I don't really know her at all, but sympathise for all the sand and dirt she'll be washing out of herself for weeks. Other than that I got no feelings about her. Storm had some stuff to do at first, but then not so much. Angel/Arcangel didn't have much to do either, and I thought he was supposed to be rich. Now I don't know much about him in this either, so maybe he was. Angel can be well used to show how mutant prejudice can affect someone from a privileged background, but here I guess he was just an American cage-fighter in Germany. I'm not that bothered about Apocalypse. He is a fairly boring villain all things considered. I don't really understand why he disliked things so much considered the time period he lived through was pretty much when things were invented and popularised by humans. Oh look, it's Wolverine again, for no real reason, except that he has to be there, I guess.